Although the late, great Dieter Moebius is best known for his groundbreaking work with Kluster, Cluster and Harmonia, he also enjoyed a successful solo career. However, Dieter Moebius’ solo career had to fit round his other musical commitments. So solo albums were sporadic. In total, Dieter Moebius released just five solo albums during a recording career that lasted five decades. Dieter Moebius had released his debut album Tonspuren in 1983. Another thirteen years passed before Dieter Moebius released Blotch in 1996. 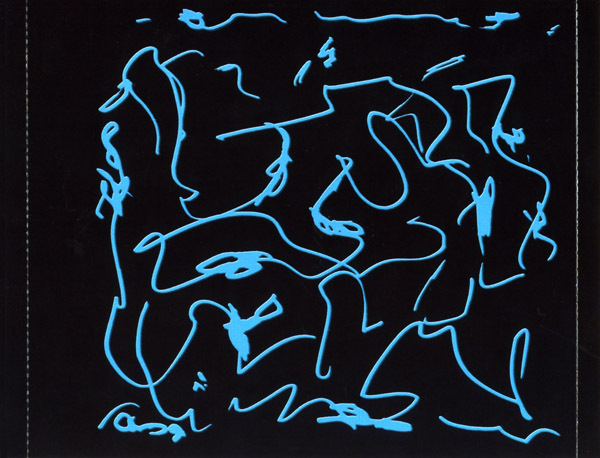 During that thirteen period, Dieter Moebius had been busy with Cluster, collaborations and writing the soundtrack to Blue Moon. Still, Dieter Moebius found time to record his sophomore album Blotch. It was released in 1996, and was a truly innovative album. Critics, cultural commentators and awaited the release of Dieter Moebius’ third album. This time round, they didn’t have as long to wait. 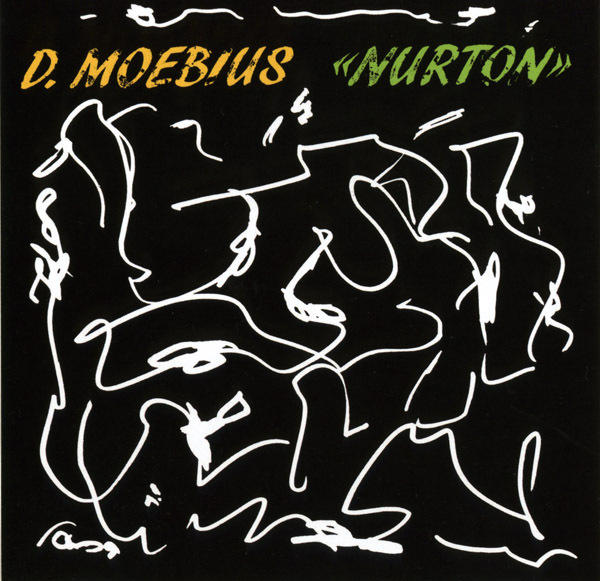 Just seven years passed before Dieter Moebius returned in 2007 with his third solo album Nurton. It was recently reissued by Bureau B as part of their ongoing reissue program of Dieter Moebius’ solo albums. Nurton was the most ambitious and experimental album of Dieter Moebius’ solo career. Throughout his career, going right back to the early days of Kluster, Dieter Moebius had railed against convention and song structure. That had been the case right back to the days of Kluster. Hans-Joachim Roedelius explained “everything was spontaneous. Improvisation was key.” That was the case throughout Kluster’s career, and continued when Dieter Moebius and Hans-Joachim Roedelius formed Cluster. 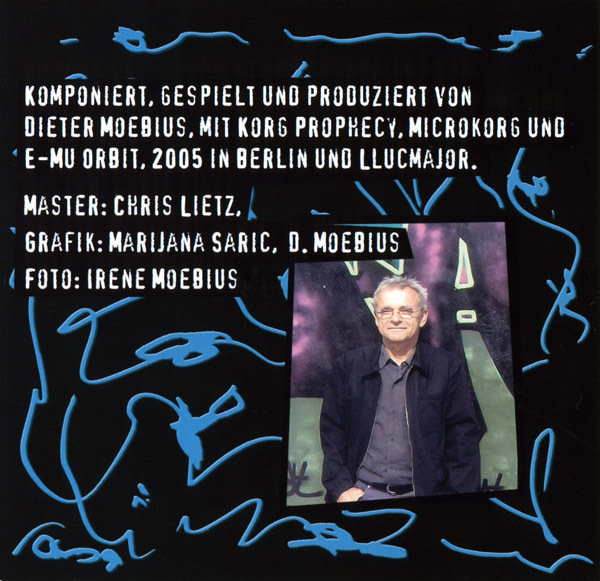 By 2007, Dieter Moebius still stuck to the same musical beliefs. They had served him well, and allowed him to produce innovative music for four decades. Dieter Moebius had been doing this since 1970. However, music and they way music was made had changed since then. By 2005, technology was playing a bigger part in music. Dieter Moebius embraced the new technology, which allowed him to push musical boundaries to their limits, and sometimes, way beyond. The new technology allowed Dieter Moebius to innovate. On what became Nurton, Dieter worked on a series of playful mesmeric loop based tracks. They’re atmospheric and experimental, with Dieter adding a myriad of sound to his musical canvas. They’re painted by using a vast musical palette. Recording of Nurton took place in Berlin and Llucmajor during 2005. Dieter used a variety of synths, including a Microkorg, an Emu Orbit and a Korg Prophecy. When Dieter recorded Blotch, the Korg Prophecy was way ahead of its time. Still it was a versatile piece of equipment which was able to replicate the sounds of various analog synths. This was a lot easier and more reliable than their analog equivalents. It meant Dieter was able to concentrate more on making music, which would be some of the most ambitious and experimental of his career. It was scheduled for release in 2006. Before that, Chris Lietz mastered Nurton. 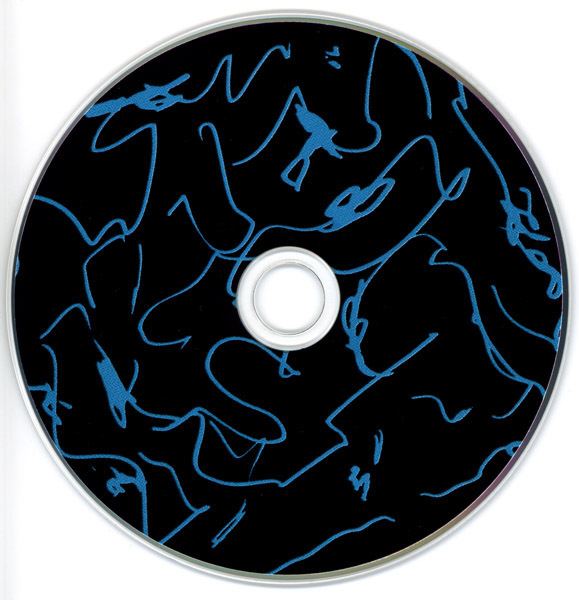 When Nurton was released in 2006 by Blue Pole Records, it featured a cover designed by Irene Moebius. Her cover was abstract, but captivating. It demanded one’s attention, just like the music on Nurton. Anfahrt opens Nurton, and straight away, Dieter Moebius sets about grabbing the listener’s attention. An almost otherworldly sound makes the listener sit up and take notice. Then a dark, deliberate, moody and spacious bass synths plays. Meanwhile, washes of ethereal and space-age synths sweep in. They drift in and out, as the track slowly reveals it secrets. It’s mesmeric and hypnotic. That’s until the man machine awakens, and lumbers across the futuristic, genre-melting arrangement. By then the track has taken on a cinematic sound, as elements of avant-garde, Berlin School, industrial, Krautrock and musique concrète play their part is a hypnotic and futuristic track. Crisp drums and mesmeric synths combine on Gängig, creating what was and still is a contemporary sounding backdrop. This becomes Dieter’s musical canvas. Dieter becomes a musical equivalent of Jackson Pollock, unleashing a myriad of sounds. What sounds like a tape unravelling at speed is joined by an alternative percussive orchestra. They beep, squeak, bubble, ring, wah-wah, jangle and buzz. All the time, drums accompany the almost mechanical arrangement. Sounds flit in and out. Some make a brief appearance, others stay longer. Constantly, Dieter throws curveballs, during what’s a captivating, intriguing and innovative melodic soundscape. Just like previous tracks, loops are used as Mahalmal unfolds. Drums pound, crack and crash, while a whirring, hypnotic synth plays. What sounds like a whip cracking, is joined by percussion and a drone. Soon, it’s time for synths to squeak, bubble, ring, and buzz. Layer upon layer of sounds are added, becoming part of Dieter’s soundscape. It’s best described as a musical stew, which he carefully stirs and tends. Sometimes, he adds ingredients, as this tantalisingly tasty dish takes shape. Although it’s mesmeric it’s also bewitching and enthralling. The more one listens, the more one hears. In the distance, the arrangement to Born Neo plays. As it draws nearer, the understated arrangement becomes exotic and experimental. The percussion is almost reminiscent of seventies Afrobeat albums. That is not surprising, given the title. They add a mesmeric backdrop, to which Dieter adds an array of futuristic, leftfield sounds. Soon two continents collide. To this, a droning, otherworldly vocoded vocal is added. Not only does this add to the mesmeric nature of the track, but adds a spiritual sound. Later, and briefly, a whirring, buzzing sound is added. Then the vocoded vocal rejoins, as percussion, gongs, whoops and sci-fi sounds are added, before the arrangement slows down, and draws to a close. All that’s left is the memory of one of Dieter Meobius most innovative, genre-melting tracks. Schleudergang literally explodes into life. Dieter uses one of loops, before a pulsating bass synths provides the backdrop for a dramatic soundscape. It could easily be part of the soundtrack to a sci-fi blockbuster. Beeps, squeaks and shrieks punctuate the arrangement. So do a myriad of futuristic and bubbling sound. There’s even the occasional bursts of a soaring ethereal vocal. Lasers are unleashed, and sound as if they’re fighting an intergalactic battle. Later, machines tap out a code, while beeps, squeaks and buzzes assail the listener. So does a dark otherworldly sounding creature. In the space of four minutes, Dieter cinematic music paints pictures that set the listener’s imagination racing. Hypnotic, futuristic and otherworldly describes the introduction to Flag. Dieter seems to be picking up where he left off on Schleudergang. Nurton is beginning to sounds like an electronic space symphony. Growling, crackling, metallic and buzzing sounds are part of this mesmeric soundscape. It’s also melodic, as Dieter combines elements of avant-garde with electronica, industrial and musique concrète. By then a bass synths is combining with whirring, metallic sounds. Synths whoosh, while others cut through the arrangement. A myriad of disparate sounds assail and tantalise the listener during what’s an aural feast fit for a King. After two beeps, Opaque heads firmly in the direction of the dance-floor. Dieter deploys his trusty synths to create what was, and still is a timeless sounding track. It’s what Kraftwerk could’ve been producing in 2007. The music is variously elegiac, slick, robotic and futuristic. Snorkel is another track with a cinematic soundtrack. It would be the perfect soundtrack to a documentary by a modern day Jacques Cousteau. Dieter conjures up images of someone exploring the depths of the deepest blue sea. It’s easy to imagine them swimming slowly and deliberately, aware that around them are any number of dangers. The sense of anticipation and danger are omnipresent throughout this cinematic soundscape. From the deepest blue sea, Story sees the listener taken to outer space, where it sounds as if two warring factions are fighting an intergalactic battle. It’s replicated by Dieter’s trio of synths, which produce an array of futuristic, sci-fi sounds. This includes what sounds like a gun fight at the sci-fi saloon between two alien nations. Why this track hasn’t been used by a cinematographer seems strange? It would be perfect for someone making a sci-fi film. Sad may have space age sound, but it’s also thoughtful . There’s a sense of sadness as the dark synths meander and lumber along. They produce washes of futuristic sounds, which prove ruminative and could even bring, about a sense of melancholia. Distant drums and crashing cymbals combine on Warum? Together, they create a mesmeric sound. Soon, Dieter is unleashing his arsenal of futuristic and melodic sound. They ask a question: Why? Constantly, bursts of synths ask Why? Meanwhile, shrill and sci-fi sounds pose the same question on what’s a powerful, potent and melodic track. As a bass synth plays a growl emerges from Moskito’s arrangement. It snarls, producing an otherworldly sound. Meanwhile, Dieter deploys his synths, and they produce whirring, buzzing, futuristic, bubbling and crackling sounds. Together, they unite to create a somewhat futuristic, but memorable symphony. There’s almost a robotic sound to April. This comes courtesy of Dieter’s synths, which grind, beep, squeak, whir, jar, whine, boing and bang. It’s like listening to robots at work. This however, proves melodic. Throughout the track, a vocal flits in and out. Dieter’s taken put a vocal through a vocoder, and detuned it. This vocal repeats, and when one listens carefully does it sing “Fame, Fame, Fame?” Later, Dieter stabs at the keyboards, while a myriad of sounds accompany him and the vocal sings out. It’s another cinematic track that’s also melodic and intriguing. Fittingly, Das Letzte closes Nurton. Slowly and deliberately Dieter play the synth. Meanwhile, sci-fi sounds escape from the arrangement. Other sounds are elegiac. What sounds like waves breaking on a deserted beach can be heard. Adding an element of darkness is bass synth. Mostly, though beautiful, wistful and ethereal describes this poignant, futuristic soundscape. Dieter it seems, has kept the best until last. Just like Blotch, Nurton, which was recently reissued by Bureau B, is another genre-melting track from Dieter Moebius. After a seven year gap, he returned with his third solo album. 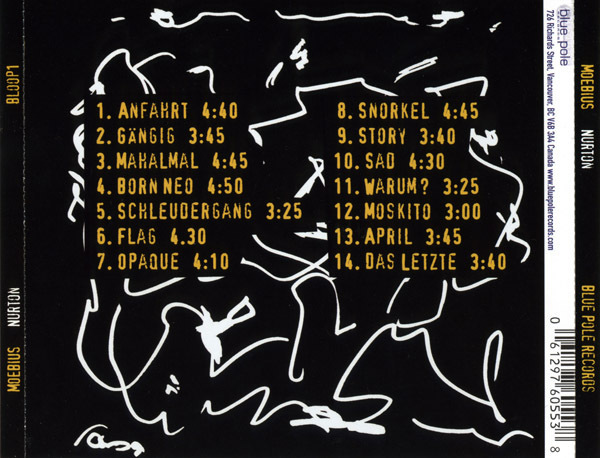 Nurton saw Dieter combine elements of ambient, avant-garde, Berlin School, electronica, industrial, Krautrock and musique concrète. There’s even a hint of African percussion on Born Neo. Along with these other disparate influences they play their part in what’s the most ambitious and experimental album of Dieter Moebius’ solo career. Dieter Moebius set out to push musical boundaries on Nurdon. He was like an artist, except that the tape was his canvas. However, Dieter had a much richer and vibrant palette available. Using his trusty trio of synths, plus loops and a myriad of left field and sci-fi sounds, Dieter got to work. Just like he had throughout his career, he turned his back on musical convention and structure. Instead, he let his imagination run riot. The studio became a laboratory, where Dieter experimented. Often, he unleashed an arsenal of sounds which punctuate the arrangement. They result in music which was often futuristic, cinematic and hypnotic. That’s not all. The music on Nurdon veers between moody and broody, to dark and dramatic, to ethereal and elegiac to understated and beautiful. Always, though, the best words to describe Nurton were futuristic, cinematic and hypnotic. Dieter Moebius had pulled out the stops on Nurdon, which was a captivating album that painted pictures in the mind’s eye. Much of the music on Nurdon would be perfect for a sci-fi soundtrack. That’s the case even nine years later. The music on Nurdon is truly timeless, and could’ve been released yesterday. Sadly, artists like Dieter Moebius are a one off. He was one of the greatest musicians of his generation, and was capable of creating music that was innovative and influenced further generations of musicians. This includes Nurdon, which was the most ambitious and experimental albums of Dieter Moebius’ solo career. ← MARIANNE FAITHFUL-NORTH COUNTRY MAID AND LOVE IN A MIST.